I write about these things because of their art and the people who still stand by them and use them. Though modern times have brought many innovations, it is the heartfelt dedication and hard work of so many of the past and present who have brought forth greatness and love. Though the press of life and enumerable distractions have turned us away from goodness, it is these people who, through their work, have brought us back to this wonderful reality. Photography is one such medium that has helped us center ourselves. It was while helping a friend in settling the estate of her late father, a retired school teacher and all around good fellow, we happened upon his photographic gear. In among the various pieces of equipment, I found this rather unusual camera. 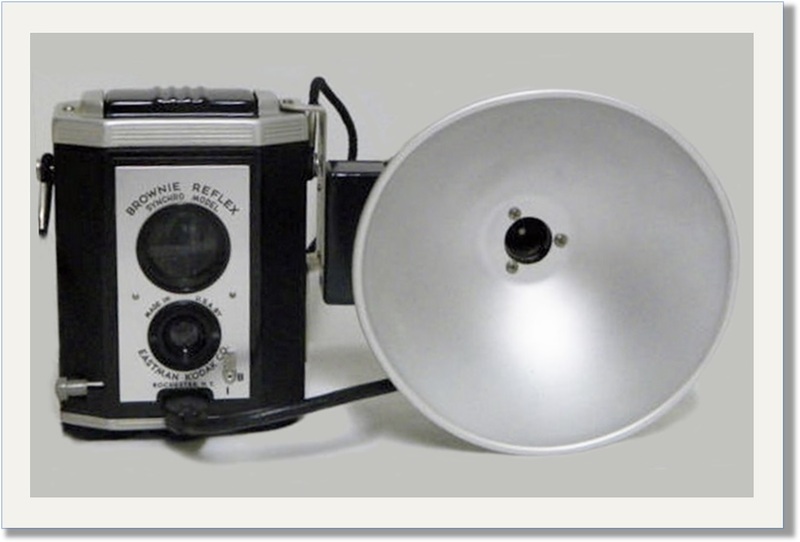 I then remembered my mother’s old Kodak Brownie reflex camera and its big round scary flash attachment. Being a green dot all automatic digital SLR kind of guy, this Mamiya camera seemed rather archaic. I was then reminded by another friend that many studios still use these cameras. Upon further investigation, I found some history on this, for me, an unusual camera. This “Mamiya C330 Professional” was one of a long line of C series medium format cameras which were Japanese built and were considered to be a higher end twin-lens reflex film camera. The C series were made between 1956 and 1994 for the professional and advanced amateur photographer. 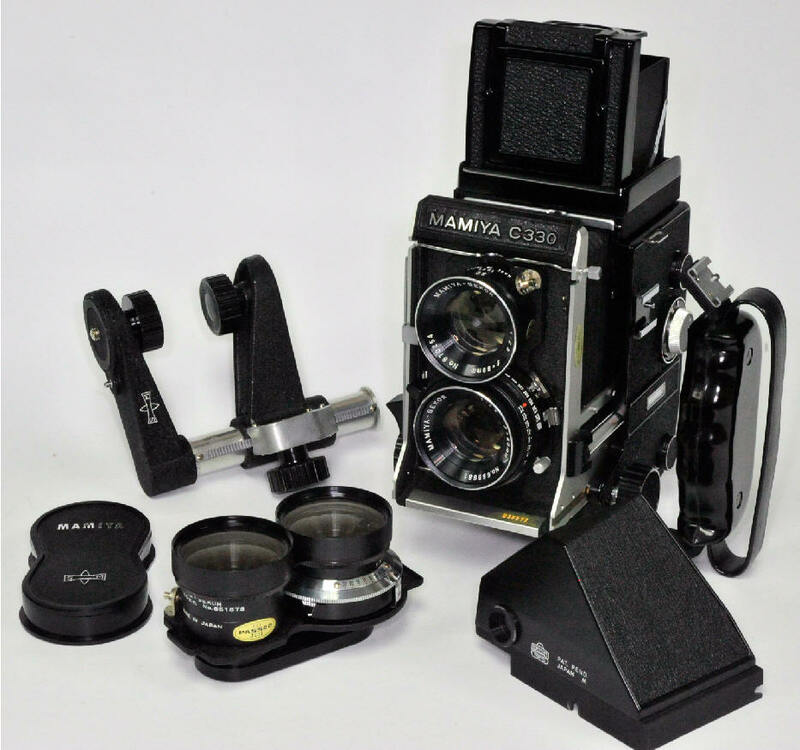 Unlike most TLR cameras, the Mamiya Cs had interchangeable lenses. The upper and lower lenses were detachable as a single unit, and were available in a number of different focal lengths ranging from 55 to 250mm. On most other TLRs including Rolleiflex, the photographer had to attach matched extenders to the existing upper and lower lenses. However, these were rare, limited in sizes, and often reduced efficiency. Another thing, this camera had a wide focal length that easily enabled macro photography without changing lenses. It has a hidden bellows that shields the light path while extending the focus to do close-ups. Of course, this reduces light efficiency as you decrease the focal length. To use most TLR cameras, including the C330, required either some sophisticated abilities or a separate light meter. This primitive camera is analogous to using woodworking hand tools such as plains, chisels, and hand saws as opposed to electrically powered table saws, plainers, routers and jointers with fences and guides. This camera`s design is very similar to early daguerreotype cameras used during Civil War times with the exception of timed exposure settings. The shutter and variable aperture were invented sometime in the late 1870s. Since then, things pretty much stayed the same even after Kodak introduced flexible film in 1885. It was after the introduction of single-lens reflex cameras and advances in electronics when automatic cameras became more commonplace. However, these manual medium format cameras remained the standard for studio use up until very recent times with the refinement of digital technology. Because digital is still rather pricy for higher megapixel medium format photography, these cameras are still widely used by many photographers seeking high definition images. 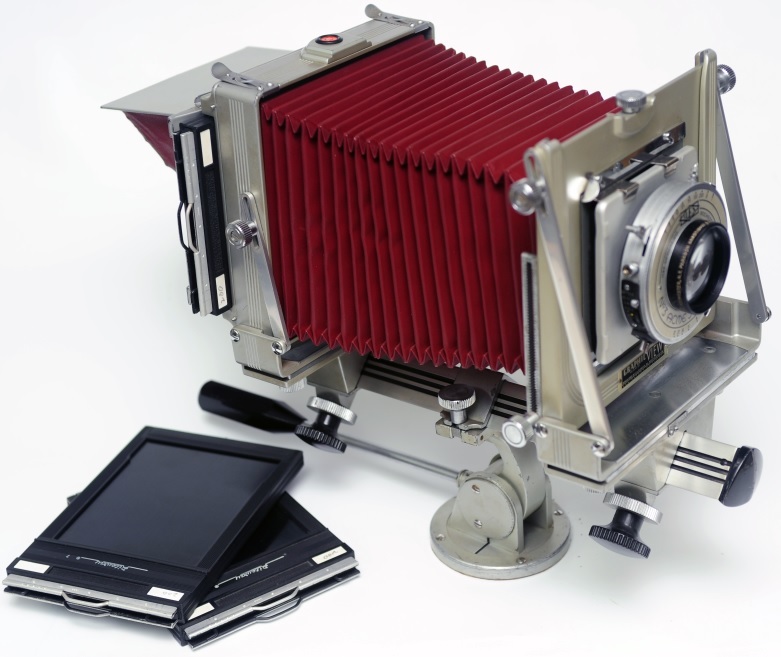 Large format view cameras are also still being used for specialized photography because digital technology has yet to catch up with large ultra-high-definition formats. Like the resurgence of album LP records, film is still quite popular. 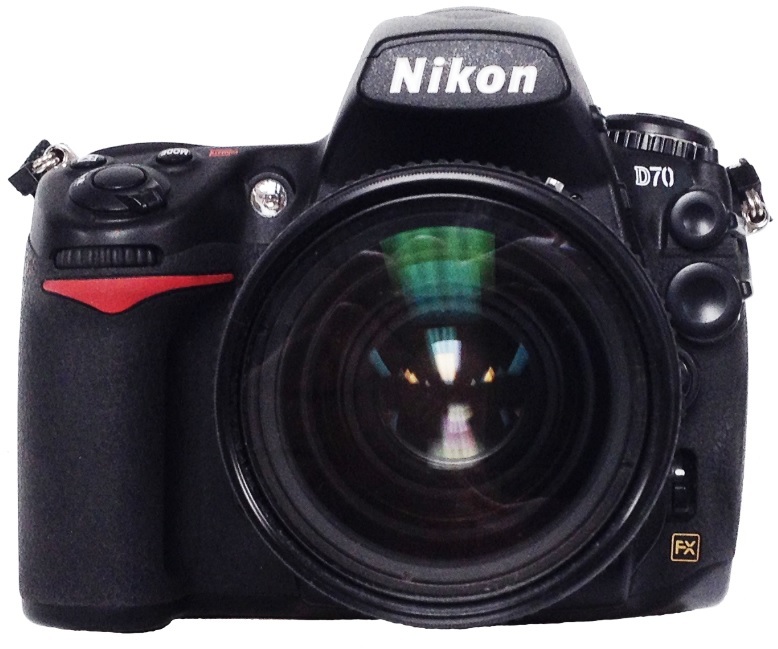 However, like recorded digital music, most photography is now being done with the digital format. Because of that, there are large numbers of these expensive cameras which are available at bargain prices. Though its cost was somewhere around $3000 in today’s market, the C330 was not the most expensive camera produced. There were hideously expensive cameras available such as Hasselblad. The C330 was one of the less expensive alternatives made in Japan similar to cameras and other electronics that are made in China today. These TLRs were the workhorses used by a large number of studios and portrait photographers. Because they were fully manually operated, these were seldom used in situations where uncontrolled movement such as sporting events were to be photographed. The C330 is a good test of a photographer’s skills. For the most part, they required a handheld light meter to setup for each shot. Though there were people who could guess at lighting conditions, most including Ansel Adams used a light meter to set exposure. Even with this, it does take a certain skill set to capture the moment with this beast. So, why do people still want these things? This is like asking, why do people still want LPs or why do some woodworkers use tools indigenous to the 1800s? The answer is twofold. First is control and quality. Second is a romantic idea of preserving the past. As I’ve said before; when LPs are new or are well cared for, they do give a better quality of sound than CDs; not to mention, they tower over MP3s in sound quality. Next, there are still woodworkers who believe they have better control over their tools when hand-making that special something out of wood. 95% of lathe woodturning is still done the same way it was done during Egyptian times. As for the C330 and 6x6 film, an equivalent digital camera capable of capturing what this one can do with 400 speed film will set you back $35,000. But I don’t think they have a digital camera that will capture what a good 80 or even ISO 100 speed film can. Also called 6 by 6, 2-1/4 x 2-1/4" or simply "Two and a Quarter." Actual image size 56 x 56 mm. 12 shots per roll of 120, 24 shots on 220. Though some photographers, who shoot 6x6, scan the negatives on a very high quality film scanner, most will scan in the final enlarged prints.